I don’t go in much for mechanical pencils but of the four or five that I own, these flat-lead pencils (sometimes called “flat-ribbon lead pencils”) are very interesting. They are both examples of the A.W. Faber-Castell TK 9600: The one in the foreground was made in the U.S. and has “Patent Pending” stamped on one side, the other was made in Germany. They are distinguished both in terms of weight (the former is considerably heavier) and by the mechanism which holds and propels the lead. This patent was assigned in 1955 to the General Dynamics Corporation, but the German 9600 was designed by one Harald Bachmann, whose patent was assigned to A.W. Faber-Castell the following year. Several other companies issued flat-lead pencils, including Caran d’Ache, Tombow, and Alvin to name a few. If the design itself wasn’t impressive enough, you have to wonder how the lead was manufactured—I imagine there was a need to fabricate new machines out of whole cloth to produce them. If regular, round graphite cores are passed through a die under tremendous pressure I suppose the same holds true for these flat leads. But how do you keep them flat and straight? Were they made of larger sheets and then cut to size? If so, were they printed on before or after that? Looking at this packaging creates an image in my mind’s eye: A factory employee asking a harried coworker, who is poring feverishly over a phone book, whether he’d like to go to lunch. . . If the flat-lead pencil was invented in the mid-1950s then it didn’t have a very long life, and I don’t know whether their discontinuation had to do specifically with this design, or with the general decline in the use of drafting pencils. But if you consider everything that had to be invented just to manufacture them, I bet there is an interesting story waiting to be told. This entry was posted in Pencils and tagged A.W. Faber-Castell, Flat-lead Pencil. Bookmark the permalink. Interesting to see the word lofting on the tube — it’s a new word for me, and it suggests how particular people were about pencils and their uses. The flat leads make me think of these graphite blades: http://gizmodo.com/graphite-razor-blades-turn-utility-knives-into-carpente-1510640726 . Interesting. Were they used for especially fine straight lines? 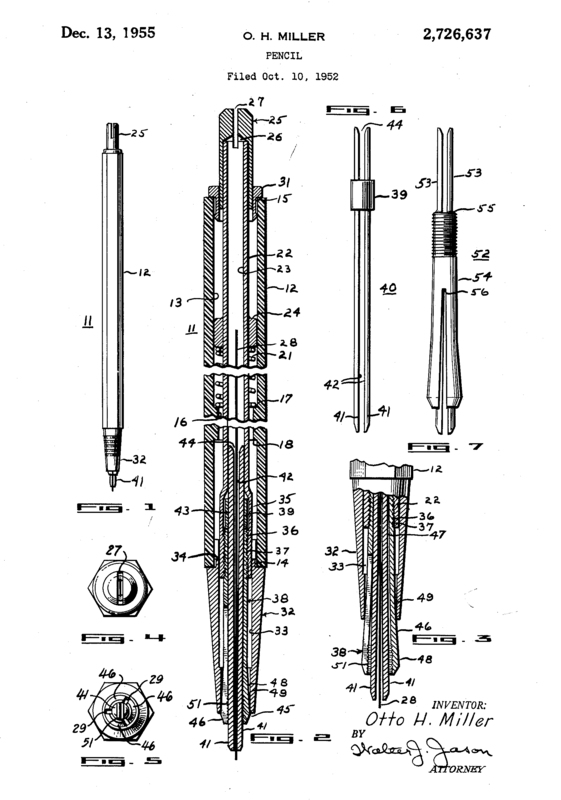 Among the wood-cased pencils, the Microtomic “Chisel-Point” probably had a similar task. Michael: I haven’t seen those blades before, very interesting. Adair: Yes, I think flat-lead pencils were an improvement of the chisel-point idea. From what I understand the flat lead, when drawn across its length, is much stronger than a pencil point. Also, lofting apparently involves drawing rather lengthy lines and the thickness of a flat-lead pencil will stay consistent, where a conical point will wear to an ever-widening line. I try to use them in a calligraphic way, but you can’t press too hard or have the lead extended very far — it just snaps. In view of the date these flat leads were produced I assume they have the same composition as regular leads, i. e. contain graphite and clay (which could explain the easy snapping). With this, they aren’t as break resistant as the polymer leads which were introduced in the mid-1960s but offer the same consistent width as the polymer leads (at least when drawing lines). I have this mental picture of these leads coming out of one of those pasta rolling machines with the wheels that cut ribbons. I’m not sure there were color versions of these flat leads; I suspect they would have broken easily, but, I’m not certain. I recently bought a job lot of pencil leads and in them were two small green containers of TK 9600 leads, in various grades and in very good condition. Since buying a TK 9600 is very expensive now they’re a rarity I was wondering where how much these leads are worth and where would be the best place to find people who’d be interested in buying them? I have no use for them and I’d love for them to go somewhere they’ll be appreciated, either practically or as a collector’s piece! Congrats on your find. Regarding their value, it’s like the old saying: “something is worth only as much as someone is willing to pay for it”. You might check online auction sites. If you can share more details about the number of leads and what grade they are, I or another reader might be willing to make an offer. I have a A.W Faber casstell tk 9600 pencil however no idea how to put more lead in it! Any ideas? I don’t have mine in front of me but if I remember correctly, try unscrewing/loosen the cone, which should allow you to push the lead up through the metal ‘feeder’. Then, tighten the cone. Hope that helps! I have one of these pencils but no idea how to put new lead in! Any ideas?